Do You Need a Master’s in Nursing To Be a Nurse Anesthetist? Do you need a Master’s in Nursing to be a Nurse Anesthetist? The short answer is yes. 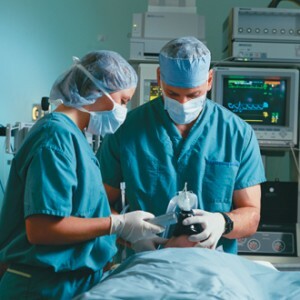 Nurse anesthetists are highly trained medical professionals that work along with surgeons and anesthesiologists to administer anesthesia and monitor patients during surgery. It is a rewarding career and one that requires a significant commitment to training and education. According to the American Association of Nurse Anesthetists, the average nurse anesthetist completes about 2500 clinical hours and administers about 850 anesthetics before becoming certified. Although certification is a long process, being a nurse anesthetist is a rewarding career that is highly paid and in high demand. interacting with patients, often at a stressful time in their lives. It is also necessary to have the desire to learn more about the pharmacology and administration of the drugs used in anesthesia and be comfortable with the complicated machinery used to monitor patients during surgery. When choosing a graduate nurse anesthetist program, it is important to make sure that the program you are interested in is accredited by the Council on Accreditation of Nurse Anesthesia Education Programs. Most graduate programs take from 24 to 36 months to complete. Nurse Anesthetist programs involve coursework in pharmacology, pain management and physiology, combined with extensive clinical training. After completing the program, candidates must pass a national certification exam in order to become a Certified Registered Nurse Anesthetist (CRNA). Nurse anesthetists are in high demand in the job market providing cost effective, quality healthcare to patients. The estimated average salary of nurse anesthetists can be upwards of $148,000 per year. Nurse anesthetists work in many settings including hospital operating rooms, surgery centers, pain clinics, dental offices, and delivery rooms. They are responsible for all anesthesia related patient care including patient assessment before anesthesia, administering anesthesia, maintaining anesthesia during the procedure, evaluating patients after anesthesia, and following up with post anesthesia care in the recovery room. Nurse anesthetists work in close association with other health care professionals such as surgeons, anesthesiologists, dentists, obstetricians, and dentists. Becoming a certified registered nurse anesthetist requires years of study and clinical experience. It can be a demanding but stimulating career for those willing to put in the time and effort. The training is not easy, but the rewards are great. If you are a registered nurse with a bachelor’s degree in nursing and are looking for financial and job security, then becoming a nurse anesthetist may be worth the rigor. Yes, those interested in anesthesia will need a Master’s in Nursing to be a nurse anesthetist, but your extra schooling is likely to lead to a lucrative career.